Looking for beer themed party favors? 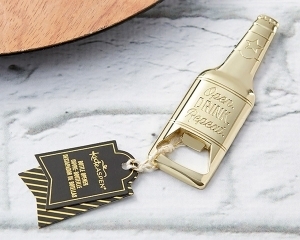 These gold, beer shaped bottle openers are just the thing. Good looking and practical! Here's looking to a great time at your celebration! Please allow up to 7 business days to fulfill orders with personalized favor tags (4 days without); add ship time from GA.